Here we go again with the supernatural. Atheists don’t believe in the supernatural, so it’s time to close the book. But I didn’t close the book – I kept reading. This series, Convince Me There’s A God, is my answer to questions atheists have been asking me for more than 40 years about why I ‘abandoned’ atheism and ‘converted’ to Christianity. Many have accused me of being on drugs at the time of my conversion or having gone insane. Neither is true. I became convinced after a lengthy investigation into the claims of Christianity that the God of the Bible exists and Jesus Christ rose from the dead. My conversion from atheism to theism was intellectual, not emotional. It was based on many kinds of evidence, but the evidence that kept me reading and asking questions about the Bible was archaeological evidence. Did that evidence “prove” God’s existence to me? No, but it did show me that the Bible was a credible ancient historical document and kept me interested in learning more. The Book of Joshua is about how a man named Joshua led the people of Israel from the wilderness north of ancient Egypt into the ‘promised’ land of Canaan. The city of “Adam” mentioned in Joshua is believed by many researchers to be Tel ed-Damieh located near the Jabbok River (modern Nahr ez-Zerqa)and Zaretan. Tel ed-Damieh is about 16 miles north of Jericho (Tek es-Sultan). 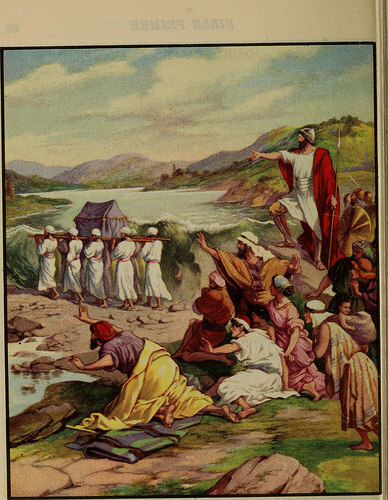 Historians have noted a blocking of the Jordan River in that same area in 1160, 1267, 1534, 1834 (AD) and again in 1927 when earth tremors caused large amounts of rock and dirt to fall into the river and block it for many hours. The flow of the Jordan is north to south, so a blockage several miles north of the place where Israel crossed into Canaan might be possible. The Sea of the Arabah (the Salt Sea) is south of Israel’s crossing, so that would explain the “failure” of the waters to go “down into” the Sea with a north-to-south river flow (see map). According to the Bible’s story Joshua already had an idea of what he was getting into before he led Israel to cross the Jordan River. The Bible claims Joshua sent two spies to view the land Israel would be traveling to, especially the city of Jericho. They were emboldened by news while spying in Jericho that the people there feared the God of Israel. With this news ringing in his ears, Joshua led Israel to cross the Jordan and attack Jericho on God’s orders. Did this really happen? We look to archaeology for answers. The first official archaeological find concerning the ancient city of Jericho was in 1868 by Sir Charles Warren. General Warren was an officer in the British Royal Engineers at the time he led excavations in Jericho, Jerusalem and other sites. By digging several vertical shafts at the Jericho site, Warren determined that the tells (mounds) were the ruins of an ancient people. Warren reportedly dug through mud bricks of one wall, but didn’t realize its importance. The next archaeological team to excavate Tell es-Sultan (ancient Jericho) and Tulul Abu el-‘Alayiq (3kms southwest of Jericho) included German archaeologist Carl Watzinger and theologian Ernst Sellin from 1907-1909. They discovered the twin cities of Jericho about a mile apart. One was the old city and the other was a more recent Roman city. They discovered remains of two walls which they believed dated to the biblical account (Late Bronze Age – 1550-1200 BC), but later dated the walls to the Middle Bronze Age (2100-1550 BC). Archaeologist John Garstang excavated Jericho between 1930 and 1936 and dated the upper wall to the biblical account. Garstang and his team dug to the beginnings of the city and found four levels of inhabitation. Garstang was especially interested in the walls of each inhabitation and dated the first to about 3,000 BC. He dated the second city wall to 2,500 BC and the third wall to 1,800 BC. The fourth wall stood on top of the others and had a double enclosure. The first wall was about six-feet thick, the second wall was 12-feet thick and higher than the first. Garstang found that the walls had fallen outward and there was evidence of an intense fire and believed the biblical account was correct. He dated the destruction of City IV to about 1400 BC. Archaeologist Kathleen Kenyon excavated at Jericho from 1952 to 1958 and believed that Jericho was already in ruins at the time the Bible claims Joshua and Israel were attacking and destroying the city. She dated the destruction of City IV to about 1550 BC and believed it remained unoccupied for more than a century-and-a-half after that. Kenyon’s findings led many to believe Israel’s conquest of Jericho may have been much later than the Bible’s date. As I was investigating the various findings of excavations at Jericho, archaeologists were still debating the issue of the dating of the destruction of the walled city. Though I found the debate about dating interesting, what kept me searching was the fact that the ancient walls of Jericho were found to have fallen outward, the city burned with intense heat and the lack of habitation for a long time following the destruction. I didn’t know what it might prove, but the Bible story had a ring of truth to it. I was determined to learn more.